Pilkington Pyrostop with School Guard Glass is an important step towards safer schools. It provides critical defense against fire. During an intruder attack, it gives students and staff the upper hand by taking away the element of surprise at access points and delaying ingress. 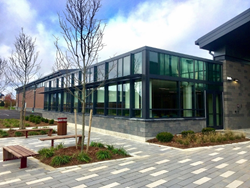 To expand security glazing options in fire conditions, Technical Glass Products (TGP), a brand of Allegion, and The LTI Group are now working together to offer Pilkington Pyrostop® laminated to School Guard Glass®. The fire-rated, forced entry and bullet-resistant transparent wall panel is designed to help delay intruders while maintaining a high level of fire and life safety in schools and education facilities. It is fire-rated for up to 120 minutes, offers a Level III bullet-resistance rating and withstands 12+ minute forced entry attacks in compliant doors and frames. A brand of Allegion, TGP is your one source for fire-rated glass and framing systems, along with specialty architectural glass products. For more information on Pilkington Pyrostop laminated to School Guard Glass, along with TGP’s other fire-rated framing and glass products, visit http://www.fireglass.com or call (800) 426-0279. For more information on School Guard Glass, visit http://www.schoolguardglass.com or call (844) 744-5277. Allegion (NYSE: ALLE) is a global pioneer in safety and security, with leading brands like CISA®, Interflex®, LCN®, Schlage®, SimonsVoss® and Von Duprin®. Focusing on security around the door and adjacent areas, Allegion produces a range of solutions for homes, businesses, schools and other institutions. Allegion is a $2.4 billion company, with products sold in almost 130 countries. For more, visit http://www.allegion.com. The LTI Group (LTI) is leading providers of innovative laminated glass and polymer products to a broad variety of industries, such as architectural, automotive, airline, marine, entertainment, security and industrial – among others – around the world. For more information about LTI’s products and services, call (413) 637-5001 or visit http://www.ltisg.com.